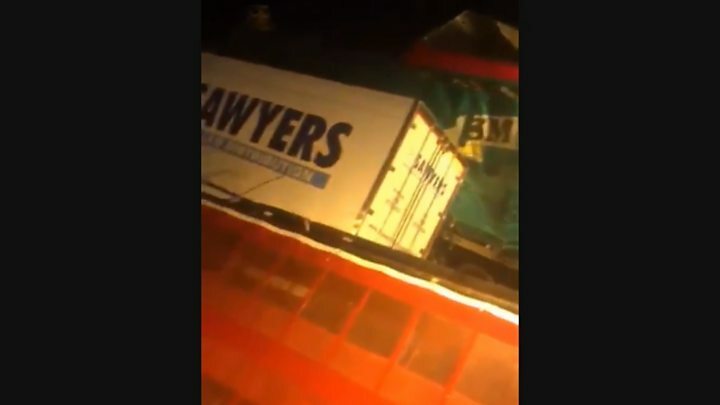 A safety warning has been issued after a number of lorries crashed on to their sides during a ferry sailing from Northern Ireland to Scotland. The Marine Accident Investigation Branch (MAIB) has highlighted the dangers of drivers remaining in their cabs during a crossing. It found at least six stayed in their vehicles during the incident between Larne and Cairnryan in December 2018. 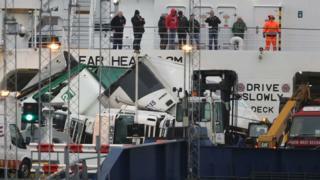 It warned a ferry's roll-on roll-off deck was a "hazardous" environment. An investigation is ongoing into the incident on board P&O's European Causeway ferry during "strong winds and very rough seas" on 18 December with a full report expected in due course. However, the MAIB has published a safety bulletin flagging up key issues raised by the events. while a ferry is at sea the roll-on roll-off decks should only be occupied by "trained professional seafarers"
It said the crew on the European Causeway had instructed drivers to vacate the deck after parking their vehicles but a number had stayed in their cabs. Four drivers were found in vehicles that had toppled over and one had to be freed by emergency services in Cairnryan. "Fortunately nobody was hurt during the accident," said the MAIB safety bulletin. It added that P&O Ferries had contacted other operators to look at ways to tackle concerns about drivers staying in their cabs. The MAIB urged all ferry companies to "engage positively" to help address the "urgent safety issue". It also recommended that the Road Haulage Association distribute the bulletin to members and encouraged them to take "robust action" to help stop drivers staying in their cabs. A spokesman for P&O Ferries said: "Working closely with the MAIB, P&O Ferries has contacted ferry operators in the United Kingdom who may be affected by the issue of drivers remaining in vehicle cabs on ro-ro decks. "The aim is to encourage operators to contribute to a discussion forum to collectively eliminate this problem."